This is the first card of the day, just a simple scalloped 6 x 6 white card, that has had the edges distressed with "Bundled Sage" distress ink. 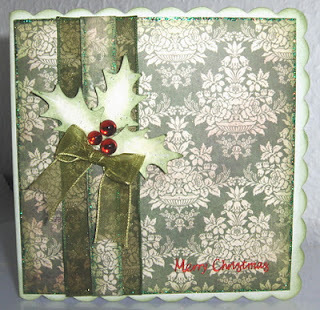 I then cut a piece of Kaisercraft paper to fit the card and distressed the edges with the same ink This piece of paper was also edges with a fine line of Stickles in "Holly". I cut a length of 1.5inch wide wired olive green ribbon and attached that to the paper. I then cut a think strip of matching paper, edges it in "Holly" Stickles and overlayed it on top of the ribbon. The holy leaves were put in place and three red cabochon adhesive gems added. 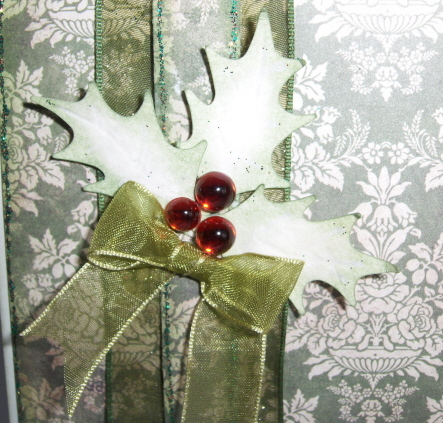 The final touches were a small olive green bow made out of ribbon and a red Merry Xmas sentiment. oh my goodness, is that inked edges I see before me!!!!! It's gorgeous Debz - and I really like the inked edges.